It’s only a legal requirement to wear a helmet when riding a motorbike in the UK, but in an accident you’ll be glad if you went the whole hog and decked yourself in proper motorcycle protective clothing or ‘personal protective equipment’. You’ll know how badly you can graze your hands and knees just falling over at walking pace, let alone doing 60mph on rough tarmac. So let’s have a look at how you can protect your whole body, starting at your head. We wrote aseparate guide here about how to choose the best motorbike helmet (the link opens in a new window). You’ll also want to take a look at our guide to wearing glasses with your helmet. Apart from wearing helmet and back protection (which we’ll get to soon), your neck should be protected from the elements if you are riding in cooler weather. You can lose a lot of heat through your neck therefore a long balaclava or a scarf will do the trick – you don’t want to be getting hypothermia when you are riding because that will dull your reactions and make it difficult to think. Earplugs are cheap and will reduce hearing damage from loud bikes. Some motorbikes are so loud that they begin to cause irreparable hearing damage after less than one hour’s riding. The plugs will drop around 25dB off the volume of the engine and as sound pressure and our tolerance to exposure is exponential that means that you could spend all day on the motorbike and only have received the same amount of sound energy as one hour without plugs. 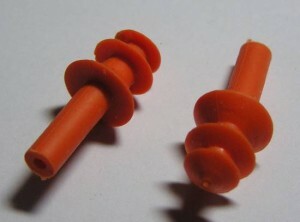 There are several different styles of earplugs, from the basic moulded foam ones that cost a few pence, to the moulded silicone ones shown on above, through to specially design acoustic baffles which are used by clay pigeon shooters and professional musicians and cost a couple of hundred quid. You’ll need to experiment to find the ones that suit your ear canals the best and are comfortable while wearing your helmet. Noise causes fatigue so by cutting the noise down you will arrive more refreshed. Your two main items of clothing will be a protective jacket and a back or spine protector or kidney belt. If your jacket has a decent collar then you might not need a scarf or balaclava. Apart from your helmet your jacket is the most visible part of you to other road users. To be as visible as possible we recommend a bright-coloured helmet and either a bright-coloured jacket or a fluoro vest over the top of your jacket. The jacket should be made of an abrasion-resistant, waterproof, breathable material and be the correct size so that you can wear whatever you need to underneath without it being tight. Some jackets come with a removable liner so that you can use them in summer. Some come with zips along the bottom at the back to zip to your pants which gives you added protection in a crash because the jacket won’t ride up exposing skin. The same principal applies to the sleeves where they should have secure cuffs. You’ll need to simulate sitting on your bike when you buy the jacket to make sure that the arm length is long enough when you’re reaching for your bars. Many jackets will have built-in padding for the elbows. If not, you can purchase separate elbow protectors that fit under your jacket. It’s important with a jacket that you can operate the pockets with gloves on, and that there is at least one secure pocket either with buttons, a zip or Velcro. T here’s a large range of styles and materials available, including going for the classic material, leather. But the material alone won’t protect the second most important part of your body (after your head): your spine. Back protection will protect your spine and ribs. Many jackets have pockets for spine protectors (check whether they’re the right size before you commit to purchasing a specific one). If your jacket doesn’t have a back protector pocket, buy a back protector with shoulder straps. A back protector is extremely important – almost as important as the helmet because it can mean the difference between being confined to a wheelchair after an accident, or walking away. You will need a decent set of gloves to keep your hands warm. Cold hands don’t operate controls as well as warm hands. 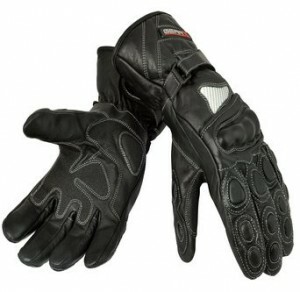 If you come off your bike the gloves will help protect your hands from grazes. They should have protection on the back. This is usually some kind of plastic or Kevlar. The gloves must be breathable otherwise your hands will get sweaty. They must also be waterproof, and not become slippery if they get wet. Some gloves will come with a visor wiper on one of the fingers. Reflective panels on the back of the gloves can help with visibility. 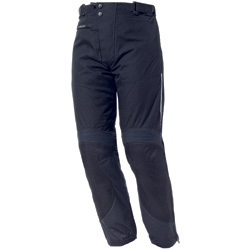 Trousers specifically for motorbikes come in various forms. There are ones made to look like denims but have durable fibres woven in to make them more protective, through to racing leathers. Good trousers will come with hip protectors and adjustable knee protectors plus resealable pockets that should be able to be operated by you when you are wearing your gloves. As you will be sitting astride a seat make sure that the seam in the crotch is comfortable. The pants must be waterproof and breathable and they’ll need to be the right size to fit over your boots otherwise they will channel rainwater down into your boots. If you have a sports bike and your legs are quite bent, the trousers will ride up more. If you have a cruiser or fatboy where your legs are straighter, they won’t ride up as much. Sit on your bike with normal trousers on and see how the leg length is, then take that into consideration. As you control the rear brake and gears with your feet, plus balance on the footrests, yourboots are very important to retain the best control of your bike. Some kind of arch support will stop your feet aching on a long ride. The toe should have protection not only for impacts but also to stop you wearing through the top on the gear shift. Shoes provide no support for your ankles and this is where boots are best as they will stop your ankle being hyper-extended. 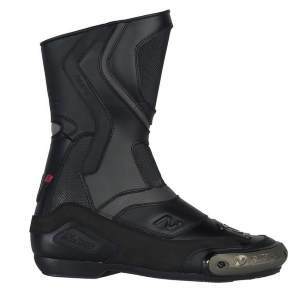 Boots should come to mid-shin height and have shin protectors. This is important because in many crashes the riders legs or shins hit the handlebars which can cause fairly bad localised trauma (breaks and haematomas). Watch this video below of this quite low-speed high-side crash. There’s a slow motion replay and you will see the rider’s leg hit the bars at about 0:55 – this is how boots will save you a broken leg. Boots should be easy to put on and take off and should have reflectors on the heels and toes. They should be a comfortable fit otherwise you will end up with numb, tingling feet. Some kind of base layer to keep you warm and wick sweat away will be beneficial in some climates. The kind of breathable merino wool or synthetic fabrics that snowboarders wear can be very suitable. All-in-one suits which zip up the front are also made. 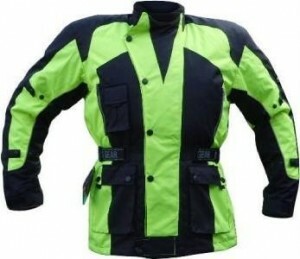 Similar to racing suits these are made for sports bikers and stitched to be comfortable in a riding position rather than a walking position. 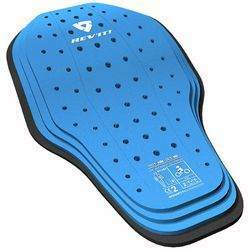 They usually feature significant back protection plus built-in slider plates for your knees and elbows, and padding in all the places it’s required. They are difficult to get off unless you wear undergarments.